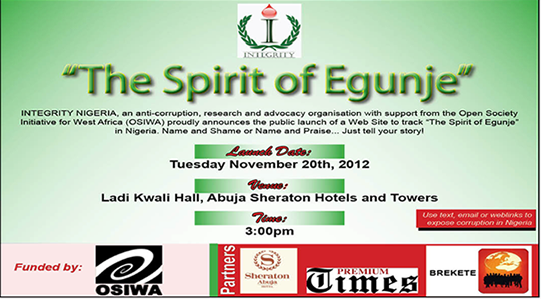 The Invitation to the Public Web launch of the ” Spirit of Egunje” Event. As we look forward to the pleasure of having you, please confirm your attendance to the launch or send a representative where you are unable to attend. To confirm attendance please contact Kyura Nyam on kyuran2001@yahoo.com, 08034088572; Patricia Ekpo on ekpopatricia@gmail.com, 08187366162; Kator Abaagu on jiromu_kator@yahoo.com, 08055800633.